Yesterday, Giles and I took a trip to Bristol to meet Andrew Hunter from Dodolab, for our first City As Material event outside of London. Rising early to jostle with commuters, gazing out the windows as London slipped away, we found ourselves wishing the grey clouds starting to form would soon depart. Giles recounted some of Bristol’s trading history as a major seaport – first cloth and food, then tobacco and plantation goods, and most recently motor vehicles and other industrial goods. The diverse influences these commodities have had, and the industries that grew from them, were apparent as soon as we stepped out from Bristol Temple Meads station. Classical architecture nestles alongside warehouses and work yards, the skyline an eclectic mix with multiple layers and contrasting shapes. We headed towards the city centre, past absurdly named company headquarters and a block of ultra-modern flats being developed, the new exterior half grafted on to a former electrical station. Deeper in, the surroundings became rundown and slightly seedy, with plenty of covertly named “massage” parlours. The intensifying rain only added to a faint sense of melancholy. This was soon replaced by the overwhelming juxtaposition of Broadmead shopping centre, its multitude of intersecting walkways and floors giving off a definite M.C Escher vibe. Andrew met us outside a great little cafe in Stokes Croft, Zazu’s Kitchen, which we soon entrenched ourselves in and planned our next steps. He was interested in exploring Harbourside and the water, having already spent some time in Stokes Croft, a burgeoning counter culture hub, and an area with complex issues commonly cross-examined. Along the river we passed some quirky houseboats and a cafe named after Brunel – a name with plenty of homages in this city. The tranquil water, with the cultural and community identity of the people who live and work on it, was a marked contrast from our first footsteps into Bristol. We worked our way towards the Clifton suspension bridge, past crumbling piers, their supports stuck firm in glossy silt, and amazing houses that resembled Spanish villas, ornate features at odds with the hectic road on their doorsteps. 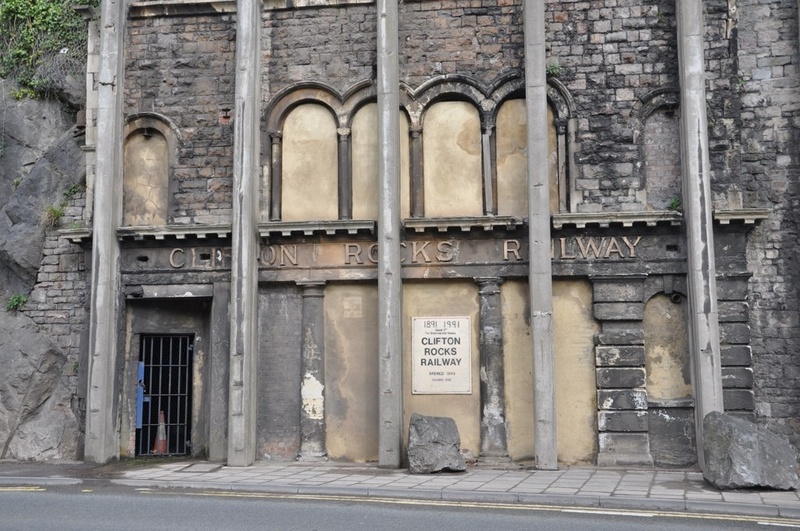 Clifton Rocks Railway, a former underground train system set into the cliffs, peeked out from behind bricked up windows and sheer walls. We clambered up a steep path cutting into the cliffs, through a temporary haven of greenery sheltering the first bees of spring – pleasantly disorientating after the industrial harbour. Exhausted, we arrived by the Clifton bridge, and were rewarded with a staggering view of all we had just passed through. Giles pondered the design of the towers, looking almost Egyptian rather than Victorian. The banal toll houses seemed out of place as well, a mix between a bungalow and a bus shelter. After discovering the observatory nearby was closed, Andrew passed a fitting summary of our experience in the city: “Visiting Bristol is hard a get a grasp on. 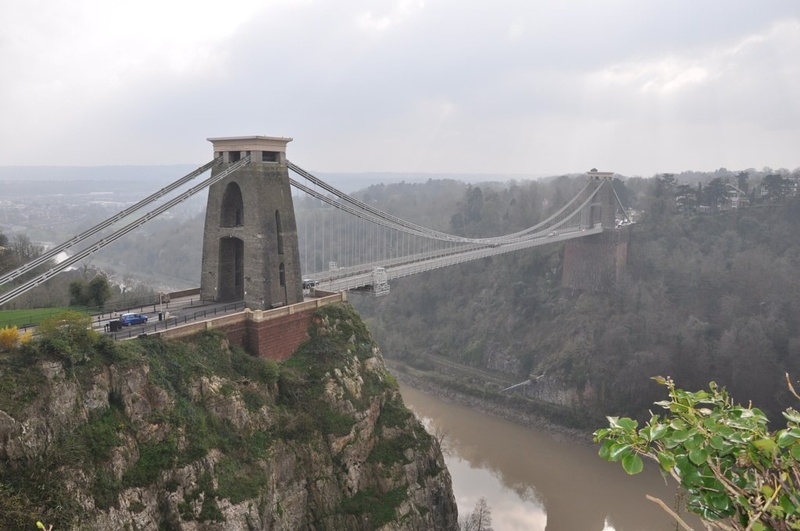 You get little peeks of contrasting areas and senses, and when you finally get to the top and get a chance to put it all together, you’re denied.” Our take on Bristol is as seen by the curious tourist, perhaps one that benefits from only glimpsing portions of it. After all, whats left to do and wonder after putting the puzzle together? We’re currently brewing ideas for the publication. Look out for it soon. 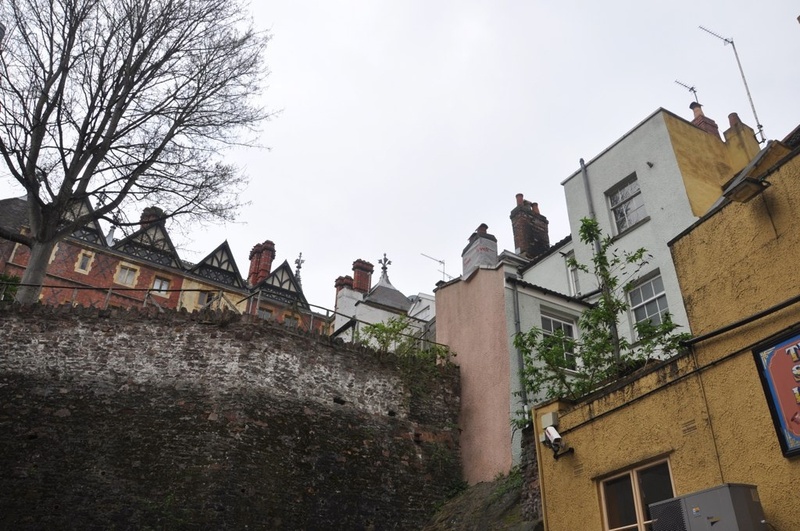 Take a peek at the City As Material: Bristol photos here.